With the National League season complete we now know the line-up of teams for the 2018/19 season. Macclesfield Town and Tranmere Rovers both secured promotion to the Football League, while Chester, Guiseley, Torquay United and Woking have all been relegated. Chesterfield have dropped into non-league football after spending 97 years as a league club, while Barnet return to the National League after a three-year stay in the EFL. Salford City and Harrogate Town won promotion from National League North, with Havant & Waterlooville and Braintree Town matching the feat from the southern division. Read on as we take a look at four clubs who could challenge for honours in the National League next season. Relegation was never on the agenda when Chesterfield moved from Saltergate in 2010 and targeted the Championship in their new 10,000-seat stadium. That dream has quickly collapsed as budget problems with the stadium, a boardroom walkout and a string of unsuccessful managerial appointments took their toll. Promoted to League One in 2014, Chesterfield reached the play-off semi-final for another rise to the Championship as recently as three years ago but lost to Preston North End. Manager Paul Cook left for Portsmouth, key players were sold and the collapse since then has been spectacular. The club has already made five new signings as it bids to bounce back at the first time of asking. If you think they can achieve the feat use this promo from 10bet to wager on the outcome. Wrexham have appointed the former Wales international Sam Ricketts on a three-year contract, his first managerial job. The 36-year-old left his role with Wolverhampton Wanderers’ youth set-up to succeed Dean Keates at the Racecourse Ground. The Dragons, owned by Wrexham Supporters Trust, missed out on this season’s play-offs by three points having been top of the table as recently as February. Ricketts won 52 caps for Wales between 2005 and 2014 and played in the Premier League for Hull City and Bolton Wanderers as well as spells with Swansea City, Wolves and Coventry. His main objective in North Wales will be to gain promotion to the Football League after an 11-year absence and his leadership skills should see Wrexham mount a serious challenge for success next season. Barnet have re-appointed John Still as their new manager following their relegation to the National League. The 68-year-old replaces Martin Allen, who left the Bees after failing to keep them in League Two. Barnet were seven points adrift of safety when Allen was appointed on March 19 but they were relegated on goal difference on the final day, despite the former Brentford, Cheltenham and Gillingham manager winning five of his eight games in charge. Still has agreed a two-year deal at The Hive and returns to Barnet for his third spell in charge of the club. He has previously guided Maidstone, Dagenham and Luton Town to the title in what is now the National League. Salford City, the club co-owned by Manchester United’s ‘Class of ’92’, have continued their rise up the ranks by securing their third promotion in four years. Joint managers Bernard Morley and Anthony Johnson celebrated promotion to National League for the first time in the club’s history last month, but ‘irreconcilable differences’ over personal terms have seen them depart. The duo have been replaced by former Scunthorpe and Fleetwood boss Graham Alexander and he has been tasked with taking the club into the EFL. Alexander made 981 appearances in a 23-year club career that included spells at Scunthorpe, Luton, Preston and Burnley. He was sacked by the Iron in March following a winless run of eight games. The 46-year-old has already added Fleetwood captain Nathan Pond to his squad and it would be a major surprise if they are not challenging for another promotion next term. Little Brothers – don’t you just love them. But what about football club little brothers? There out there, often forgotten by local fans and the media but that doesn’t mean we shouldn’t recognise them and the impact they have. Ferdinand, Wilkins, Rooney, Terry, Ross. Legends in their own way I am sure you will agree. But what if I was to tell you I was talking about Anton, Graham, John and Paul (and Paul)? The siblings of Rio, Ray, Wayne and John (and Jon)? Not quite in the legends bracket are they? The same can be said for some clubs as well. Whilst some towns and cities can boast two (or more) clubs playing at a professional level, other places in England have a definite big brother v little brother arrangement. 2014/15 was a good year for the two teams from Norwich. Whilst City triumphantly returned to the land of milk and honey, beating Middlesbrough in the Play-off final at Wembley, United stormed to the Eastern Counties League Premier Division Title, finishing a ridiculous 26 points above 2nd place Godmanchester Rovers. However, for a number of reasons the club declined promotion to the Isthmian League, waiting for two more years before finally making the jump up to step 8 of the English Pyramid, by which time City were back in the Championship. United were originally formed as Poringland back in 1903, playing at the superbly named “The Gothic”. They were renamed in 1987 and moved to their current home, Plantation Park back in 1990. With United’s best run in the FA Cup when they made it to the Second Qualifying Round it may be some time before they meet in a competitive match. Just a couple of seasons ago the two teams from Cambridge were separated by just one division as United were playing in the Conference Premier and City in the Conference South. Today they are separated again by four divisions as United have returned to the Football League whilst City suffered enforced relegation in 2008 when their Milton Road ground failed a FA Inspection and then again from Step Seven. Worse was to come for City as they became embroiled in a legal battle over the ownership of the ground, which has now been demolished, forcing City to first groundshare with Newmarket Town, then Histon and now with St Ives Town. It looks like a long way back before the clubs will be on an equal footing. In recent times Lewes have actually played both City and United in competitive games, although few Rooks fans will want to remember our visits to the City of Spires as we lost in the Conference Premier back in 2009, then crashed out of the FA Trophy in November 2014 to Oxford City, now playing in the Conference South after being shunted across from the North Division. City’s recent experiment of importing La Liga cast offs almost paid off as they finished just outside the playoffs, although the locals didn’t appear to warm to the experiment with crowds at Marsh Lane rarely broke the few hundred mark. City were once managed by Bobby Moore, with Harry Redknapp as his assistant. Whilst both Lincoln City and United have played Non-League football as recently as last season, they are light years apart in terms of facilities and momentum. Promoted as champions of the National League last season and enjoying a spectacular FA Cup run to the Quarter-Finals and the Emirates, City have the 10,000 capacity Sincil Bank with four almost new stands. This season they are sitting nicely in the Football League Division Two play-off spots. Travel west from Sincil Bank for a couple of miles and you will reach the leafy tranquillity of Ashby Avenue (formerly the impressively-named Sunhat Villas & Resorts Stadium), home of The Amateurs, Lincoln United. Currently played four steps below City in the Northern Premier League Division One South, their local derbies are against the likes of Cleethorpes Town, Goole AFC and Spalding United in front of a hundred or so fans. In May 2013 Ipswich finally got their hands on a trophy in front of an excited crowd at Portman Road. Ipswich Wanderers that it, not Town. Wanderers won the Suffolk Senior Cup in that year on penalties in front of a crowd of 1,000. Whilst The Tractor boys have been stuck in the Championship ploughed field for a decade, The Wanderers are on the up. They were promoted back to the Eastern Counties League Premier Division in 2014 and finished last season in 10th place. Their former chairman is a familiar name to some – Terry Fenwick – the man who decided not to tackle Diego Maradona when he scored “that” goal in the 1986 World Cup Quarter-Final. If only he did perhaps he could have now been chairman of Ipswich Town. There are others of course. Swindon Town may consider their local rivals to be Oxford United or Bristol City but Swindon Supermarine, the original works team from the Supermarine airplane company, will have a different opinion. 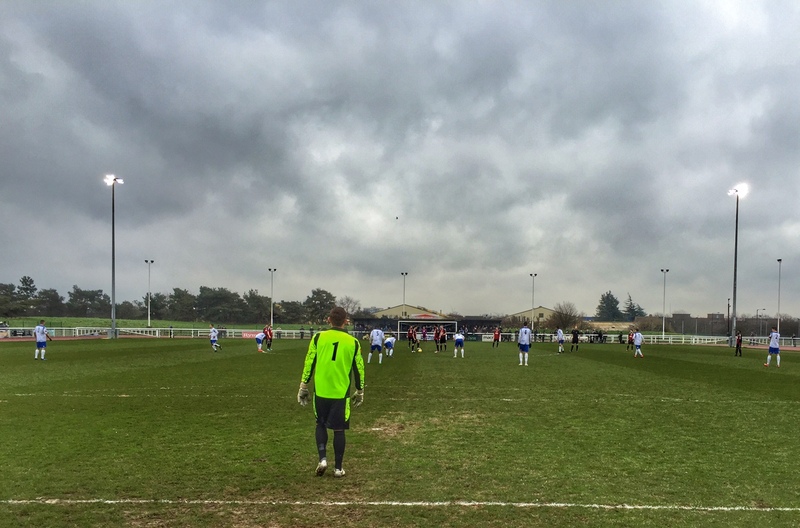 Southend United fans may think that their local rivals are Colchester United but what about Essex Senior League Southend Manor? There was a story a few years ago about a disillusioned Newcastle United fan deciding to turn his back on St James’ Park and support Newcastle Town. The only problem with this one is that the teams play 191 miles apart – Newcastle Town are based in Newcastle-under-Lyme. There’s defeats and then there are last-minute, defence lapse after you’ve been on top for 89 minutes 55 seconds sort of defeats. 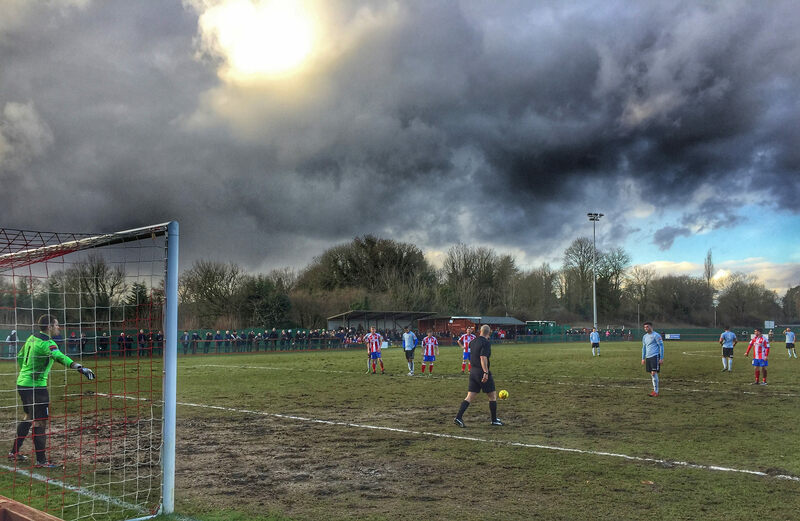 Yesterday’s game at Dorking fell firmly into the latter category. There’s only so much preparation you can do prior to games both in terms of analysing the way your opponents play, and adapting your line up and formation accordingly. With almost every member of the first team squad available to train, Darren Freeman’s major problem on the morning of the game was who leave out. 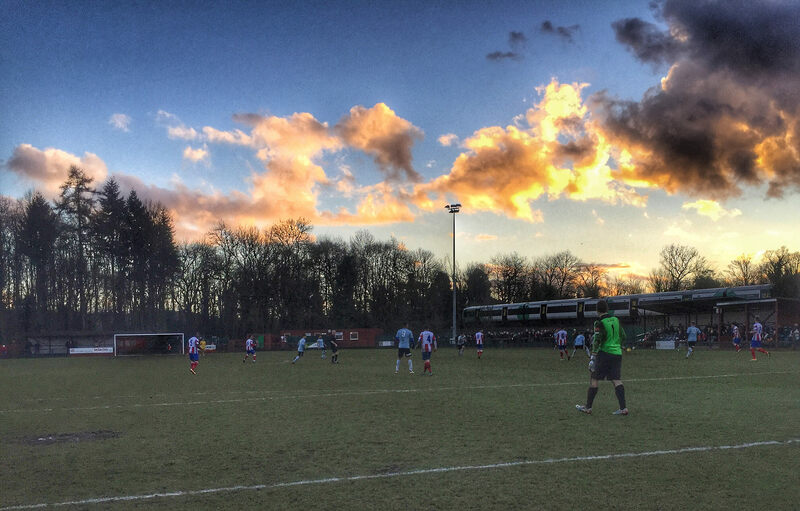 We’d seen enough of Dorking, who have topped the Ryman League South longer than any other side this season, to know how they would play and where our opportunities would come from. The difference between teams at the top of the league and those firmly stuck in mid-table at this time of the season is bravery. Do we go to places like Dorking and set up to grab a point? Or do we go with the full intention of winning the game, concentrating on our strengths and their weaknesses rather than the other way around. Lewes of old would have certainly taken a Craig Levin approach to away trips (Scotland famously played a 4-6-0 formation under his leadership in the Czech Republic once) but today we have a squad of talented individuals whose sum parts are much greater than their individual contribution. If the players believe in themselves then the fans will follow, just as they did yesterday when over 80 Lewes fans added some noise and verbal encouragement to the afternoon. How much of a difference does that make to the team? An unbelievable difference. Players want to play for teams where the fans care. Opposing team goal keepers certainly cannot ignore the noise and the comments coming from the likes of Cynical Dave standing just a few feet behind them. At our level they simply do not experience that from many sides, especially away support. If every time as a keeper you know that 80 voices are encouraging you to make a mistake, only the strongest characters will be untroubled. Yesterday we all did our bit. Darren, Ross, Codge and Paul prepared the team. The fourteen players who were involved in the game gave everything. The fans never gave up hope. But sometimes you fall just short, irrespective of the effort of everyone involved. A 2-1 last second defeat in those circumstances is harder to stomach than getting smashed 5-0 to a team below you in the table. We started positively, full of running and stretching the play. Dorking play a similar game to us, which would have led to this being a fantastic match for the neutral, less so for an away fan as the game went into the 90th minute. Our formation saw us use our full-backs as overlapping wingers, trying to get behind their full-backs and pull the ball back for our midfielders running. Twenty five on the clock. Full-back Matty George cuts inside his man, takes a touch past a second, gets a lucky rebound from a third and is through one-on-one. The ball just runs away from him and he goes down under the challenge from the Dorking keeper. From the referee’s angle behind play it looks a certain penalty, from ours behind the goal it is 50/50. But the referee can only give what he sees and he points to the spot. Protests are pointless, but the Dorking players feel the need to do so anyway. Huk in the Dorking goal is booked. Dixon waits patiently then slots the ball in the corner. 1-0 Lewes. Our lead lasts four minutes. Dorking at their best, swapping passes at pace, catching the Lewes back four out of position and the prolific McShane smashes home. The heads don’t go down. Brinkhurst to Okoh, to Brinkhust, to Okoh. The ball is fizzled across the six yard line and Jonté Smith taps home. Bermuda’s scoring sensation jumps into the arms of Cynical Dave. Alas the flag is up. We protest, as the unwritten rule book says we should, but the goal is ruled out. Man of the match Huk in the Dorking goal seems spurred on by the taunting from the Lewes fans, pulling off outstanding saves from Dixon and Okoh. Half-time and players, management and fans alike go to re-hydrate, knowing that we won that half. The start of the second half is more of the same. Hammond shaves a post, Smith heads just wide whilst at the other end Sole hits the bar. The game could go either way, as both sides are now committed to attack. Full-back Matty George comes off. Lewes try to bring on Dan Perry but he’s having a fight with his shirt. “Go on, go on” shouts Darren as the ball is played to Stephen Okoh. Dan, who still hasn’t got the shirt on, assumes his gaffer is talking to him, so he runs on, still with his shirt only partially on, keen to join the attack. Alas, Darren’s comments were directed to the Lewes winger, Okoh, and not Dan who is promptly booked for illegally entering the field of play. Five minutes are put up on the fourth officials board. Dorking hit the ball from left to right. Brinky has switched from right to left back to cover for the departed Matty George. He controls the ball on his left, tries to push it onto his favoured right to clear but the impressive Briggs takes it off his toe and smashes it home within half a second. Dorking celebrate wildly, the Lewes side sinks to their knees. Five additional minutes don’t bring and further chances to a Rooks side who have been sucker-punched. The full-time whistle blows and the response from the Lewes fans is as warm and heart-felt as any victory this season. Every player gave everything and whilst we didn’t take any points home, no fan can bemoan the way we played, the effort, the passion. As a fan all you can ask is seeing your team give a damn, playing to the best of their ability. Sometimes it will be your day, other times you will suffer that 90th minute defeat, wandering off into that night feeling mortally wounded but knowing that you, like the players and management, will be back, full of optimism in a week’s time. Many people consider Bill Shankly to be one of the greatest football managers of all time. However, it’s hard to imagine how he would fare today where fans across the world not only expect results but entertainment. The Premier League’s global audience of millions do not want to see “games for the purist”. They want to see goals, controversy and manager’s losing the plot as decisions go against them. 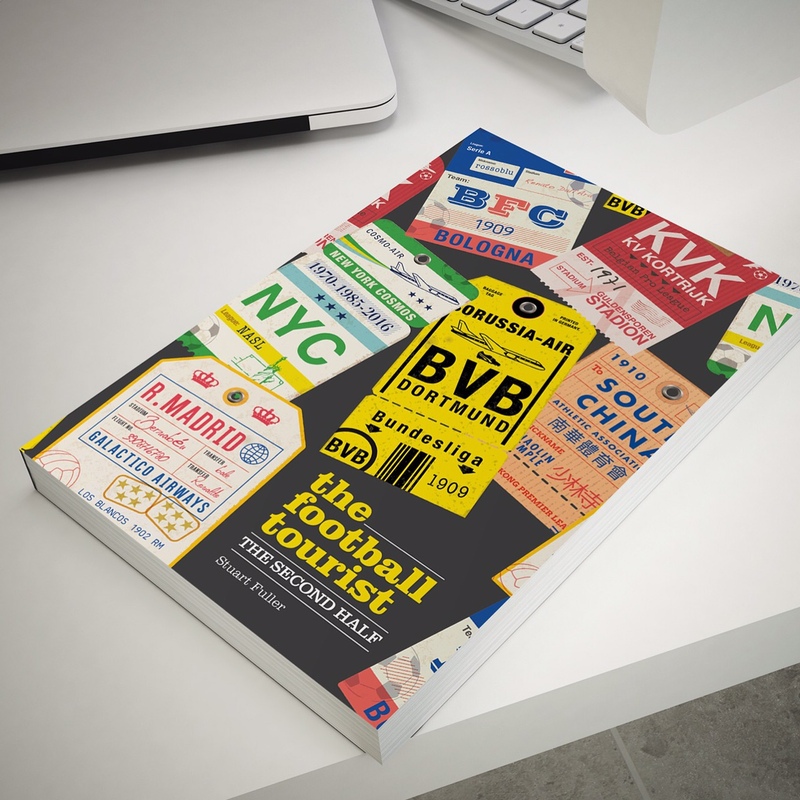 Football at the highest level in this country no longer more important than life and death – it’s about tweets, likes, posts, pins and above all viewing figures. Many Premier League clubs will make as much in incremental revenue this season under the new TV deal and their new commercial deals as they generate through ticket sales (see our analysis here) – in other words they could play games in empty stadiums and still make more money than they did last season. My last visit to watch a Premier League game live was over two years ago – I don’t miss it or the attempts by clubs to extract every single penny out of fans who do attend games. Average yield per head is now as an important metric for clubs as how many points they have (as points make prize money of course). Whilst generational supporting of one club can still be found the need to support the “winning” side means children in the playground will switch allegiances at the drop of a hat. It used to be a special treat to be taken to football when I was younger. I knew (Leyton) Orient fans, Ipswich Town fans, Gillingham fans and even Barnet fans. Hardly glamorous clubs, certainly not successful clubs (bar the Robson years at Portman Road) but they were fans because their Dad’s were, and their Grandad’s before them in many cases. I still know them today but thanks to the influence of the modern game, their kids are Chelsea, Manchester United and Arsenal fans who turn their nose up at a trip to Brisbane Road, Portman Road or Priestfield (don’t get me started on Barnet and The Hive). Live football on TV was reserved for cup finals and internationals, whilst our weekly highlights packages were fairly equitable in terms of who was covered. Today we have live games on every day of the week. For those clubs who still below the professional game every penny makes the difference between life and death of their club. Located in the shadows of one of the world’s most important and prosperous financial districts, Fisher Football Club tick all those boxes. Like many clubs who play in the Non-League pyramid they’ve been to the brink of life, only in Fisher’s case they actually experienced death when the entity known as Fisher Athletic was wound up in May 2009, having finished bottom of Conference South. Fans not only lost their club but also their ground as the Surrey Docks Stadium was padlocked shut. 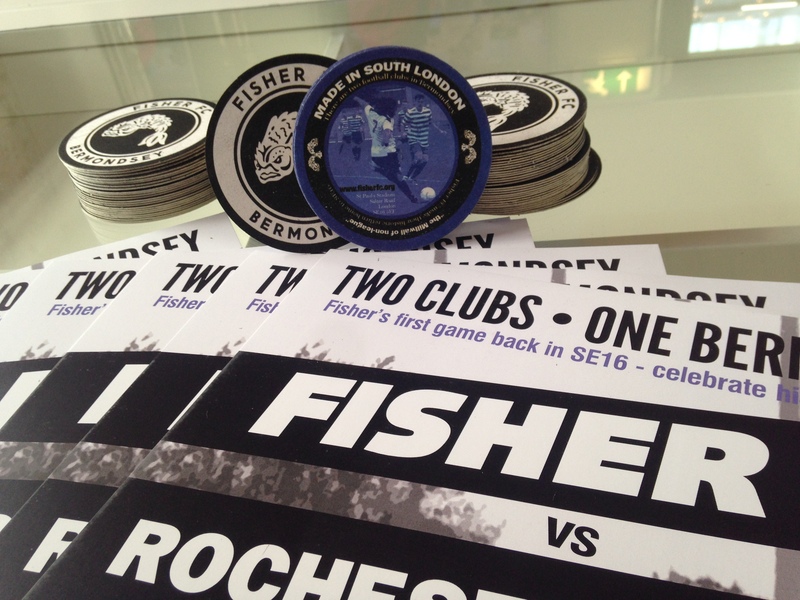 The club reformed as Fisher FC, a supporter-owned and run football club in the Kent League for the 2009/10 season, playing their home games 5 miles away at Champion Hill, home of Dulwich Hamlet. They never lost sight of their aim to return to Bermondsey though and whilst progress on the pitch was hard going, the blood, sweat and tears shed off it finally ensured that they finally got their wish last summer when the redevelopment of the St Paul’s Stadium was complete, no more than a few hundred yards away from the site of the old Surrey Docks Stadium (now smart flats which a Premier League player may even struggle to afford in a week’s salary). The fall of the original club had been at the pursuit of the dream of becoming London’s newest Football League club, ignoring the fact that they sat just two miles from The Den and Millwall FC. Building a fan based is significantly harder than losing it and whilst when times were good Lions fans would come and watch when the team were on the road, attendances struggled to break the high hundreds. It’s an all too familiar story to Lewes fans, and one told superbly by David Bauckham on his visit earlier in the season. 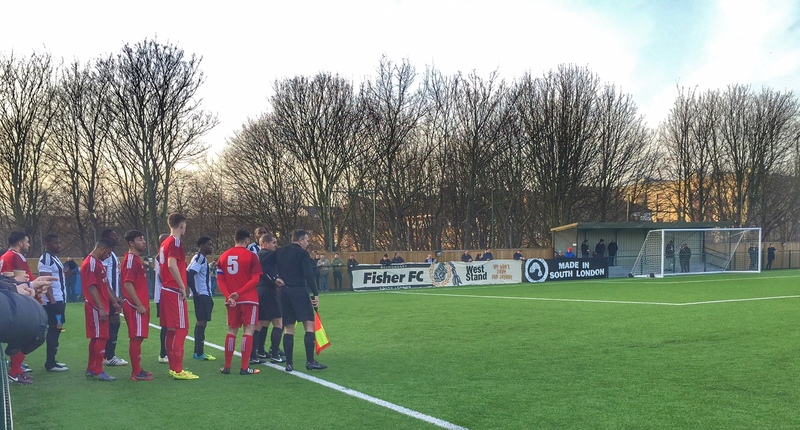 With Millwall hosting Swindon on Boxing Day, Fisher took the decision to move their kick off to Bank Holiday Tuesday, hoping to maximise on Turkey-weary, sales-averse local fans as well as a smattering of groundhoppers who had the opportunity to visit the new ground. 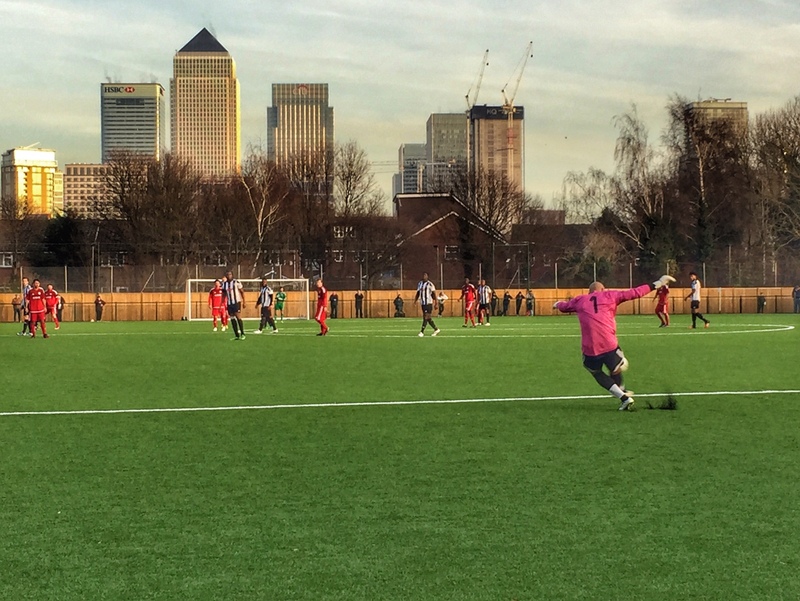 Whilst times may be tough on the field, propping up a league that is now more competitive than ever and featuring teams with bigger playing budgets and average attendances than many teams in the Ryman Leagues above, the club have been busy re-engaging with a new generation and influx of local residents into Bermondsey. The area around the stadium is still prime development land, sitting in the shadow of Canary Wharf and whilst the demographics of those who live next door may be more akin to Stamford Bridge or The Emirates, the club’s community programme is trying to spread the message that wearing the black and white of Fisher in the playground is as acceptable as those worn by the Premier League obsessives. Day four of my Christmas break and I’d yet to get to a game. Having admired the work of the club for many years (their Christmas poster for their game a few seasons ago against Greenwich Borough was legendary), hearing they would be stocking Fourpure Beer and the prospect of getting a view of the office from a different angle made my mind up that I’d be heading to SE16 for my penultimate game of 2016. There’s few better sights for those who work tirelessly behind the scenes in Non-League football than queues. Queues at the turnstiles, queues at the bar, queues to buy half-time raffle tickets. The crowds had flocked to St Paul’s Stadium for this game that pitted bottom v second to bottom of the Southern Counties East Football League. Prior to today’s game, the biggest attendance since returning home in the summer was 189 for the opening league encounter with Corinthian. With ten minutes until kick off it was clear that number would be broken for this game. Despite their lowly position, improvements had been made since Gary Abbott had been sacked in November, replaced by former boss Dean Harrison. 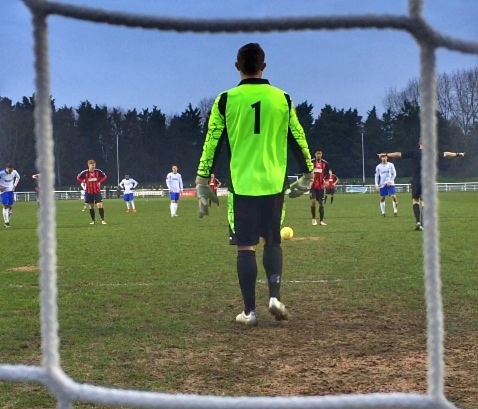 A draw in their previous game against AFC Croydon Athletic had halted a run of nine successive league defeats. Whilst there had been some departures, talisman Trey Williams was available through his dual registration agreement with Welling United. Harrison had brought in some strength into the spine of the team including Montserrat keeper Nic Taylor. The home side certainly put aside any concerns about recent form and dominated the opening period with chances going begging. With 15 minutes played, Fisher took the lead after Beckenham keeper Adam Highsted dropped Adeshina’s cross and John Ufuah tapped home. Five minutes later a smart Fisher move almost saw Williams double the lead but the Beckenham keeper saved well. On the half hour Taylor pulled off an outstanding save from a sliced clearance from his own defender to keep the score at 1-0 whilst at the other end Williams, Ufuah and Bugden all had chances to double Fisher’s lead. Half-time and advantage Fisher. Time for a beer. The second half followed a similar pattern. 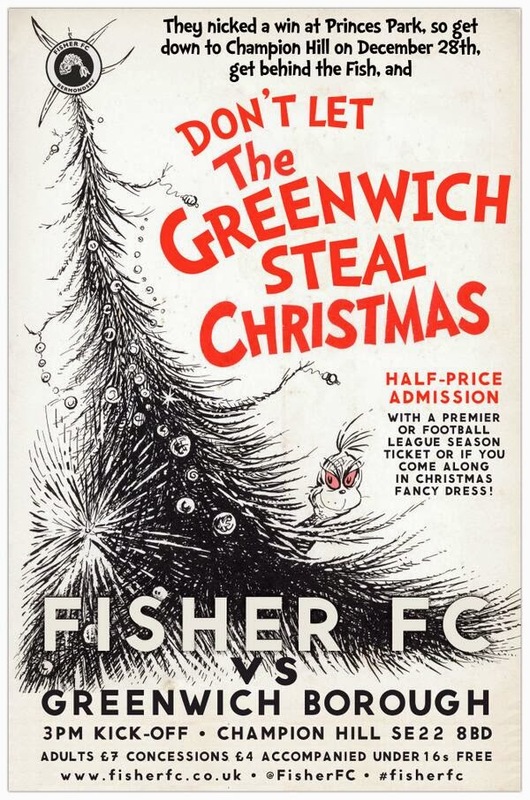 With the lights of Canary Wharf illuminating the skyline like a huge Christmas tree, Fisher went in search of a second and almost found it when substitute McKenzie hit his shot straight at the keeper. In the 74th minute Beckenham’s Humphris is ruled offside when he turned in from close range but it’s their last real chance as the home side wrap up the points thanks to Agyemang’s header via the crossbar with five minutes remaining. The win narrows the gap to just one point with the visitors although there’s still plenty of work to do before safety can be considered to be within their grasp. The defeat for the visitors was their eleventh in a row in all competitions, a run they need to bring to an end swiftly before it’s too late. Whilst the three points were valuable to Fisher, even more so was the crowd and the happy faces of those leaving the ground at full-time, having played their part in a community-inspired dream that hopefully shows no sign of fading yet. OK – let’s start with the positives. We all got a free pint to drink during the first half thanks to a great gesture by Enfield Town, a thank you for our support in their campaign for justice at the end of last season. Not just your run of the mill fizzy-pop either. A fine pint of Redemption’s Rock The Kazbek no less. And boy did we need it in a first half where the pre-match instruction from our management team to “make sure Whitely doesn’t cut inside onto his right foot” lasted approximately 200 seconds when Whitely cut inside onto his right foot and scored. The goal came as a bit of a shock to be honest, even though a) Enfield Town had won their last four home games, b) We have the second worst away record in the league, conceding on average 2.3 goals per game and c) We hadn’t gone behind in a game this year. Could we have another beer voucher? The scars of last season’s debacle have been forgotten by most at the club, although the initials FA certainly don’t mean the Football Association in these parts. It’s fair to say that our governing body didn’t come out of the whole affair very well, and even at a meeting before Christmas with the chairman of the Ryman League, looked to deflect blame from their failings. Fortunately, plans are afoot at our league level to change rule 6.9 which would now mean the Ryman League could handle the situation very differently if it occurred in the future. How difficult was that? Well as simple as changing the word “shall” to “may” in terms of how the league penalise clubs. It took 30 seconds for the votes to be counted back in December’s League Meeting for that to progress. Anyway, back to the action. We always looked like we would concede another in the next thirty minutes but somehow we didn’t. Then we started to remember how we had beaten Dulwich Hamlet, Canvey Island and Merstham. We started passing the ball, stretching Enfield’s midfield and defence. We had a great chance for Laing to run in on goal in the last-minute of the half. However, the ball never reached him as the Enfield Town full-back decided to play basketball with the ball in front of the linesman, who tried to justify the fact he wasn’t looking by pointing to his chest. The Enfield player walked off at half-time hardly able to contain his laughter. We kept pressing in the second half, chipping away at the back four, looking for a way through. Laing had a great shout for a penalty turned down when he was pushed to the floor. No penalty, yet no card for “simulation”. So what was it then ref? Jonte Smith’s far post header was turned around the post by an Enfield leg and with seconds left we could sense something was going to happen. Laing again bamboozled the defence and his cross struck and outstretched arm. Referee points to the spot. Could it be? Smith stepped up in the most languid of ways and rolled the ball into the corner of the net. We’d take a point our jumping around on the terraces said. We’d hardly had time to tweet using the hashtag “unbeatenin2016” before we’d conceded again. Back in August we took the lead at home to Harrow Borough with a penalty in the 87th minute. 67 seconds later we conceded after switching off and had to settle for a draw. Today our point lasted marginally less. Enfield Town were given a free-kick on the left-hand side, pumped it into the box and someone (later identified as full-back Doyle) headed it in. It’s hard to smile and share pleasantries post match in the boardroom when you lose like this. Enfield Town’s hospitality was second to none and whilst the conversation, according to the unwritten boardroom protocol, completely avoided the a) result, b) the last gasp goal, and c) the fact we were still bottom, you couldn’t help thinking what could have been. Since 1965 Christmas football has been the preserve of Boxing Day. One of the most eagerly anticipated days of the season, where crowds are bumper, especially in Non-League football. This is despite the complete lack of public transport. Take Brighton & Hove Albion’s trip to Brentford for a 1pm kick off. The Seagulls fans had to set off around 8am, get three trains and a rail replacement bus to arrive by 12.30pm for the 60 mile journey. Then, of course there is the weather. Fortunately, the South had been spared, for now, the torrential rain that had caused widespread flooding in certain areas. Every December there is a call from various Premier League managers that they play too many games and that there should be a winter break. This nearly always comes from manager’s who have just lost (again) and need to blame something other than the fact their team was actually crap. The BBC News reported that “Even Premier League players had to train on Christmas Day”. So , someone who is paid up to £500k a month (and the rest!) has to work on Christmas Day? How is that a story? Policemen, nurses, firemen and soldiers also had to work. Did they get a mention? No of course not. With an impending trip to the North and the need for a bit of intel on our opponents next week, I navigated around the shopping traffic, or as the BBC said “Millions braved the Boxing Day sales” (no hype there then) to take in the South M25 derby. 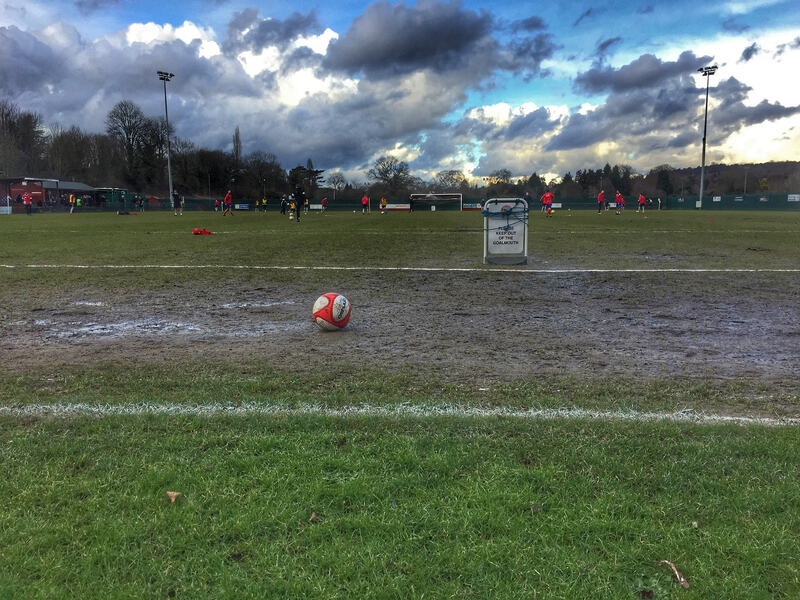 To sum up the game in five phrases – Muddy, End to End, Howling misses, No burgers, Late chested winner. In the last year I have written a number of articles trying to explain some common Economic Theories using football as a reference point. 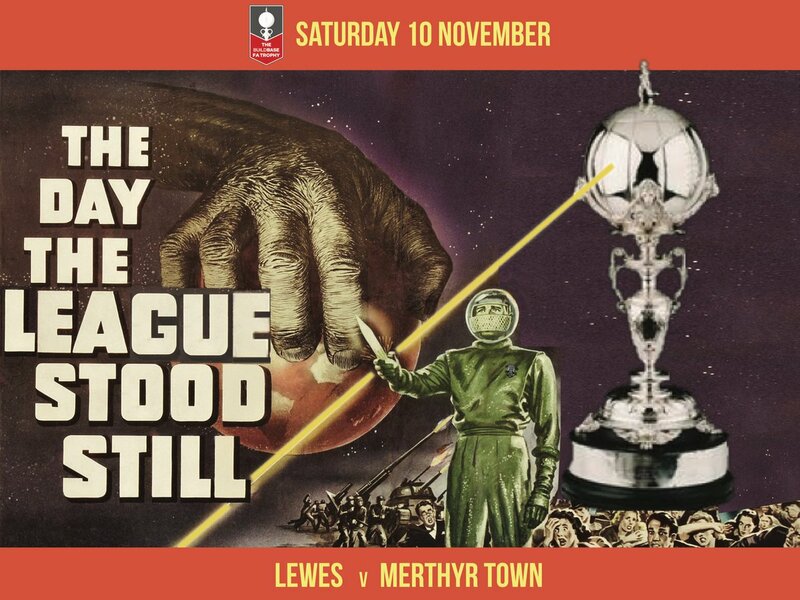 Up until now they have all been hypothetical but today there is a real link between the theory and the reality that Lewes are currently experiencing. In footballing terms, it means trying every possible variable to try and break a cycle of bad results. Just like Lewes’s current run which has seen us exit all four cups and take just one point from the last fourteen Ryman Premier League games. I think you could say that was a bad run of form. Yet within that sequence there have been many positives. Alas, football is a cruel game and failure to take chances when presented, or convert possession into something meaningful. The virtueless circle where you try anything different, whether than is a formation, personnel, preparation or set pieces to find a win. It is fair to say that you get to a point somewhere along the line where you will take any win, irrespective of how it comes. “You can’t buy any luck when you are at the bottom” said someone to me at a League meeting last week. Every club has sympathy with teams at the bottom (well, at least to your face), saying platitudes such as “your luck will turn” or “It will turn out alright”. To those 23 other teams in our league they will hope we stay down at the bottom – after all it is one less position for them to worry out. Last week at East Thurrock we felt the full effect of fate – three players ending up in hospital, one of which with a long-term injury just days after signing a contract plus a sending off that embarrassed the basic rule of refereeing about being impartial and not influenced by the actions of the teams. As results continue to be poor, crowd numbers fall. Football fans are either unconditionally loyal (circa 20% of the fan base) or are results driven (70%) with 10% sitting somewhere in between. When times are good, the crowds come and watch and spend money in the ground. When scores go against you, those results-driven fans decide to spend their time and money elsewhere on a Saturday afternoon. That is totally understandable. Alas, when budgets are set at the start of the season you do not factor in being bottom of the league – you set realistic targets for average gate revenue and yield per spectator. You can’t factor in those 2 or 3 big games that provide some extra insurance being postponed or being moved. Today we were supposed to be welcoming Dulwich Hamlet and their army of beer-thirsty fans. Instead they are in FA Trophy action. With no disrespect to Leiston, but their dozen or so fans will not make up for the hundred or so from Dulwich. So as results decline, so do the crowds and match day revenue. To keep a balanced budget that means having to cut spending in other areas, which potentially impacts the performance of the team even further. And so on – the club enters a Doom Cycle or a virtueless circle of short-term decline. I think we have dispelled the myth now that the answer to any problem is to “increase the budget”. Most fans understand that we are not in a position to do that. We have our cloth, cut to size and we have to wear it. Some fans have questioned the commitment and focus of the club, even suggesting that there is foul play at work on the board in how we manage the club’s finances. It’s tough to have the answer the same questions time and time again, especially those around the budget. There is no secret fund, piggy bag or plastic bag full of cash. Sure, we could take money from elsewhere – not paying our electricity bill or income tax, but we’ve been there, done that. Still some think that the responsibility of the individual board members is to constantly put their hand in their pocket. The game would also see the launch of our new 12th Man scheme – a different approach to adding to the first team budget. Launched at 12:12pm on the 12th of the 12th (clever, eh?) the concept has been used with some success elsewhere but even this initiative was scorned upon by some fans on Social Media – suggesting that the move was an admission of failure and neglect from the board for not putting in money the club didn’t have into the budget. Sometimes I truly wonder whether the stress is really worth it. Of course, all of the pressure would be worth it if we could grab that first win at home this season. It would be nice for once to head home with a smile on my face. This was one occasion when a draw felt like a win to the 370 Lewes fans in the ground (plus 25 Dulwich Hamlet ones – more on that later). Seven minutes into injury time and Lewes launched a final ball into the box, looking for a goal that their pressure deserved. 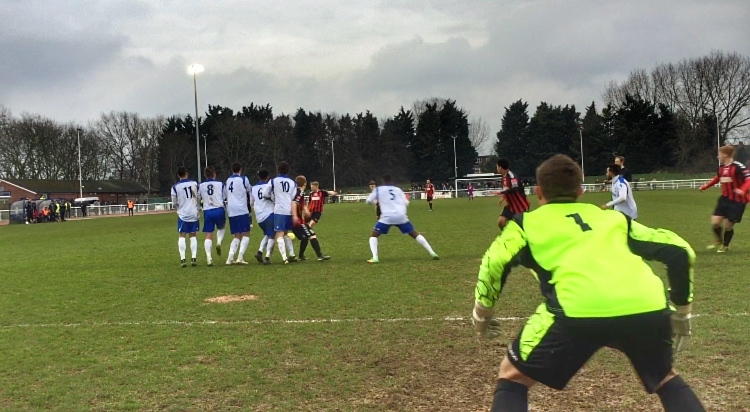 The ball must have hit every player, bar Lewes keeper Winterton in the box before James Fraser got a final touch and the ball trickled over the line. The outpouring of emotion was clear to see. There was no time to restart the game, alas as I genuinely thought we could go onto win the game. For 93 minutes of this encounter The Rooks had dominated play. Unfortunately, the same old issue haunted the team in the opening few minutes – a failure to clear the ball, a missed tackle and an opponent left unmarked. The result? 1-0 down after 4 minutes 43 seconds. The strong wind certainly played into Lewes’s favour in the first half but no matter how many times the ball went into the box, there was never a head or a foot on the end. Last week a fellow Ryman League chairman made a valid point. “The reason why week after week we have poor officials is that anyone with any potential is fast-tracked up the leagues, so we are left with those who will never get any better” Those words echoed around the terrace when the officials failed to see a clear push on Pacquette in the first half when he looked to get on the end of a Redwood cross, and more clear-cut, failing to see that McCreadie was fouled in the box in the second half, despite the marks in the turf, giving a free-kick a yard outside. The Rooks pressed in the second period, but once again the goal was leading a charmed life. At the other end Winterton was an almost spectator. This had been the story of the season – playing well for long periods but failing to convert possession into goals. That’s not down to us being a community club, the beach huts or our match posters. That’s down to not being able to find an out and out goalscorer. In fact, that is something the club have been missing for years – someone who could score us 20 goals a season and probably win us 15/20 additional points. I’m sure we all felt we had run out of time, but it was actually our opponents who gave us the goal. Despite Leiston having a goal kick, one of their players decided to make a comment to the referee. Cue long lecture and a yellow card, allowing us the additional time to score. Thanks for that! 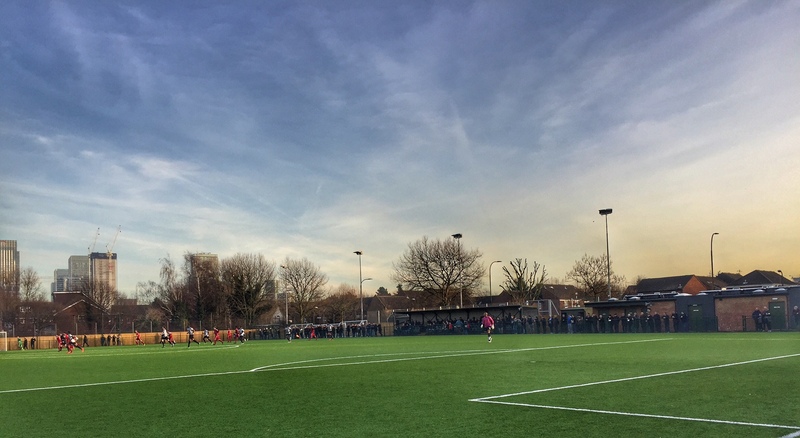 The whole crowd appreciated the point – even the 20-odd fans from Dulwich Hamlet who had come down for a stag do, arranged before their club’s progression in the FA Trophy and consequently the cancellation of our game with them. Perhaps that goal was the tipping point for our season? The one moment where our luck changes. We know that we are still in Intensive Care but for the first time in weeks we had a faint heartbeat. Has the Doom Cycle been broken? Well, we will see in 7 days when fellow critically ill patient Farnborough arrive in East Sussex.